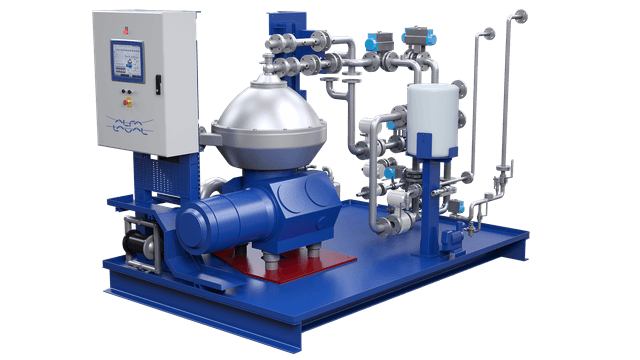 Alfa Laval PureNOx Prime is a complete water treatment system for use in an Exhaust Gas Recirculation (EGR) circuit, where it cleans both the circulation water and the bleed-off water for overboard discharge. Specifically for use with low-sulphur fuel, PureNOx Prime is a compact solution that makes commercialized EGR water treatment a reality. Built on proven Alfa Laval PureNOx technology, PureNOx Prime is a bold step forward as Exhaust Gas Recirculation (EGR) matures. Smaller and leaner than its predecessor, it gives the front-running alternative for NOx abatement a sharper competitive edge. PureNOx Prime cleans the circulation water in an EGR process. EGR is an attractive alternative for compliance with Tier III NOx reduction demands, which entered into force in NOx Emission Control Areas in January 2016. 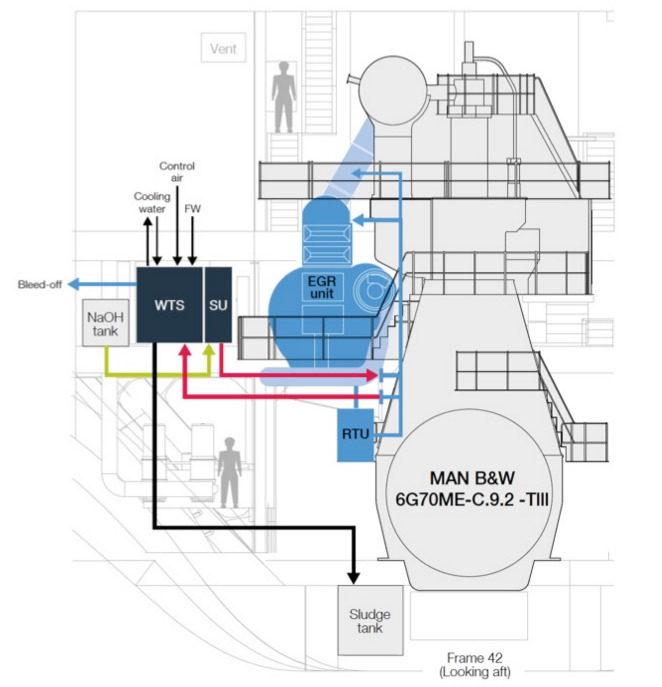 EGR offers significant advantages, including a minimal footprint in the engine room and lower operating costs for most vessels compared with other NOx abatement technologies. PureNOx Prime is a complete EGR water treatment system, developed in collaboration with MAN Diesel & Turbo. Using centrifugal separation, it protects the engine and the environment by removing soot and compounds from the fresh water in the EGR circuit. This water is recirculated in a closed loop, with additional water generated in the combustion process being cleaned and bled off in accordance with IMO criteria. Compact, modular and easy to install, PureNOx Prime is part of a full EGR system that forms an integral part of a MAN two-stroke marine diesel engine. An Exhaust Gas Recirculation (EGR) system redirects up to 40% of the exhaust gas back into the engine’s charge air chamber, which lowers the oxygen content in the cylinder and increases the specific heat capacity. This reduces the combustion temperature, which suppresses the formation of NOx. The process is immediately compliant with Tier III and can be run at very low engine loads, with a fully automated EGR control system ensuring quick and correct response to load variations. To prolong the service life of engine components, a wet scrubber in the EGR circuit uses fresh water to remove soot and sulphur oxides (SOx) from the recirculated exhaust gas. PureNOx Prime uses centrifugal separation to clean the soot and other exhaust gas compounds from this water, thus preventing them from accumulating in the scrubber and corroding the engine or EGR components. Although the fresh water is recirculated in a closed loop, a certain amount of additional water is generated during the combustion process and must be bled off. PureNOx Prime ensures that this bleed-off water can be discharged in accordance with MEPC.184(59), monitoring and logging it in compliance with IMO directives. PureNOx Prime also significantly reduces the waste volumes generated during EGR, which minimizes the costs for onshore sludge disposal. During maintenance of the water treatment system, the EGR system can be operated with reduced capacity. PureNOx Prime is fully integrated into the EGR circuit.